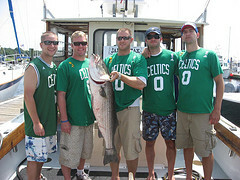 Last summer, we finished our 11th annual Harwich Head Hunt striped-bass fishing tournament, and were once again thrilled with the level of participation by local fisherman, the eager assistance of local businesses, and the encouragement to continue to make this a regular event. The 2014 tournament was a hit, with a record number of boats, a thrilling scene at the weigh in and a great post tournament party, where we had 3 fish of 40 lbs battle out for top spot, and all 3 breaking the previous all time tourney record. As avid anglers and 20-year residents of Harwich, we are aware that there are a limited (albeit growing) number of open fishing tournaments in the area targeting the recreational angler. Leveraging our current network of friends and local fisherman, we have proved that we can build this local fishing tournament into an annual event that will continue to grow over time. We continue to combine our love of striped bass fishing, trash talking at bars, and building out a community oriented event to make the Headhunt a day we look forward to every year. Last year, we worked with Jake Rooney’s who hosted a terrific post-tournament banquet with the weigh in taking place onsite as well. We are also approaching local business and media, and please email us at headhunt@gmail.com if you would like to be involved as a sponsor. We are very excited about the opportunity to put together an even better event this year, and would love to include as many of you in our event as possible. Please let us know if you have any questions and get ready for the Headhunt! !